One of the most important stories the media won’t tell you about over the last year. One of the most important stories the media won’t tell you about over the last year is the rising tide of Iranians protesting the oppressive regime they live under. American politicians who value liberty and equality are voicing their support, from Senator Tom Cotton to Mike Pompeo, but one very significant leader joined in their praise of the protesters this week, calling on a shared love of soccer to encourage the Iranian people: Israeli Prime Minister Benjamin Netanyahu. Iran is by far Israel’s biggest enemy. They openly preach the destruction of Israel and are the number one global state sponsor of terrorism, plenty of which falls on the heads of the IDF and even Israeli civilians at the hands of Hamas, the terrorist organization that controls the Palestinian Authority. 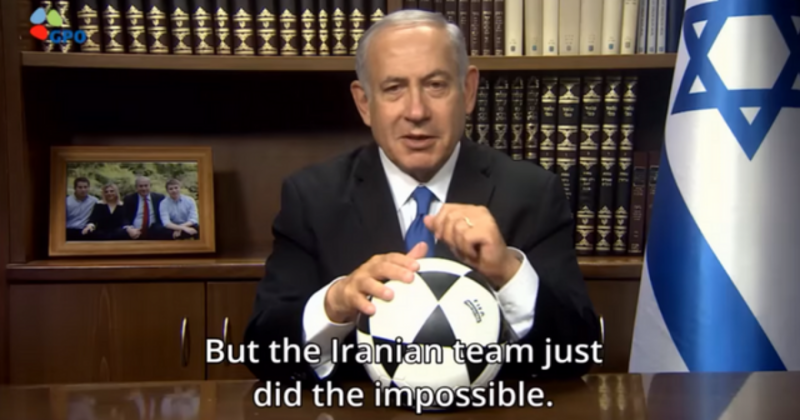 In what can only be described as an incredibly powerful and gracious move, however, Netanyahu called upon a recent soccer victory achieved by the Iranian team at the World Cup to tell the world of the tenacity and courage the Iranian people display, on and off the field, as they stand up to their corrupt mullahs. Iran has many problems – air pollution, water scarcity, billions wasted on terror. Can you imagine what would happen if the Iranian government, instead of wasting money in Syria, in Yemen and unnecessary wars in the Middle East, would start investing it in solving these problems in Iran?The solution to all these problems is the Iranian people.